Tradescantia spathacea, from my parents garden. 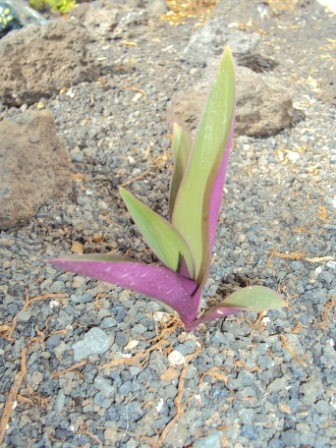 Tradescantia spathacea is a ground dwelling plant but it is known to grow on rocky outcrops, walls and to even be epiphytic on trees and other niches with no soil. This species is a sub-succulent herb whose leaves are imbricate, overlapping each other to form a rosette. The leaves are green on the adaxial side and vividly purple underneath, on the abaxial side. The flowers are what gives this species its common names, as the small, white and three petalled flowers grow inside ‘boat-shaped’ purple bracts in the leaf axils. Tradescantia spathacea’s boat-like bracts containing the small white flowers. 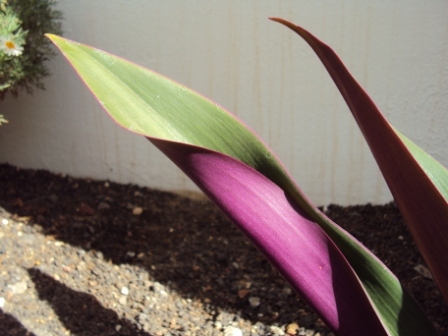 The leaves of this genus tend to be long and thin, and the flowers are most commonly blue, but can also be pink, purple or white (as is the case of Tradescantia spathacea). 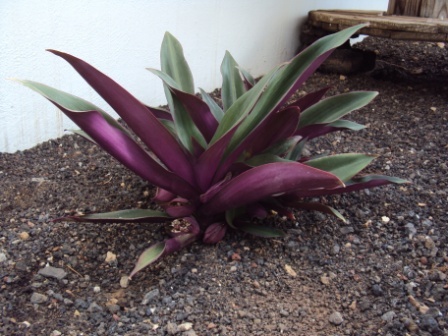 There are various members of this genus that can cause toxic reactions, characterised by red, itchy skin, as previously mentioned Tradescantia spathacea is an example of this. The main use of Tradescantia spathacea is as ornamentals and houseplants in tropical and temperate regions where this plant has been extensively commercialised for many years, as mentioned earlier this plant was introduced to other countries in the 1800’s. (3) There are many plants of this growing in the Americas bed in our Tropical Glasshouse. After this, I am going to try to not get frustrated when someone asks for the name of a garden plant from a place I’m not familiar with. I’ll remember that every garden plant has an origin, and a story. And that this is the reason I am a botanist. You are welcome Mum, and thank you for the challenge. (1) Floridata: Tradescantia spathacea [Online] Available here. Retrieved 21-11-2014. (2) David R. Hunt, (1986). “Campelia, Rhoeo and Zebrina united with Tradescantia: American Commelinaceae: XIII“. Kew Bulletin 41 (2): 401–405. (3) Invasive Species Compendium. Tradescantia spathacea datasheet. [Online] Available here. Retrieved 21-11-2014. (4) Kew Royal Botanic Gardens. World Checklist of Selected Plant Families [Online] Available here. Retrieved 21-11-2014. (5)Angiosperm Phylogeny Website. Commelinaceae family. [Online] Available here. Retrieved 21-11-2014. (6) Sadao Chikawa, (1972). “Somatic Mutation Rate in Tradescantia Stamen Hairs at Low Radiation Levels: Finding of Low Doubling Doses of Mutations“. The Japanese Journal of Genetics 47 (6): 411–421. (7) Jean H. Burns, Robert B. Faden, and Scott J. Steppan (2011). Phylogenetic Studies in the Commelinaceae Subfamily Commelinoideae Inferred from Nuclear Ribosomal and Chloroplast DNA Sequences. Systematic Botany, 36(2):268-276. (8)Sriwanthana, Busarawan, et al. “In vitro effects of Thai medicinal plants on human lymphocyte activity.” In vitro 29 (2007): 1. This entry was posted in Africa, Americas, Asia, Australia, Mexico, Philippines, Students and tagged America, Boat lily, Commelinaceae, epiphytic, medicinal plant, Mexico, Moses-in-the-Cradle, MSc Plant Diversity, Ornamental, Oyster plant, Phoebe Richardson-Moy, Taxonomy, Tradescantia, Tradescantia spathacea, Tropical biodiversity. Bookmark the permalink. 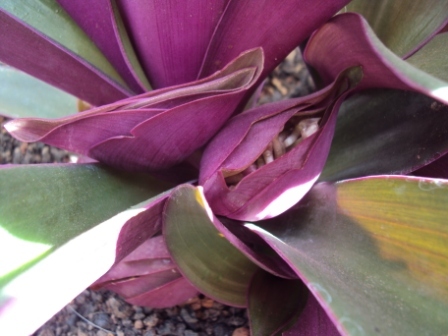 excellent blog, I have never seen any flowers on these plants.